An artist’s rendering of possible modernized OPP detachment buildings announced Friday could look like. TORONTO – A new OPP detachment building for West Parry Sound is one of nine announced Friday by the Ford government. 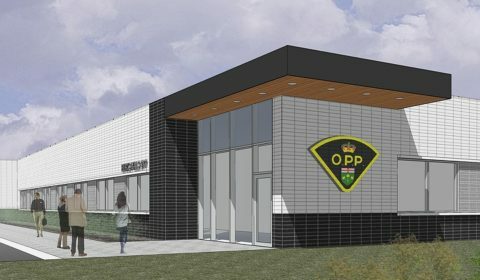 A provincial release says Ontario is investing over $182 million to replace aging police facilities’ infrastructure with nine new Ontario Provincial Police (OPP) detachments so communities can continue to receive modern, cost-efficient and high-quality police services essential to public safety. The new detachments will be located in Moosonee, Fort Frances, Hawkesbury, Huron County, West Parry Sound, Manitoulin Island, Port Credit (Mississauga), Marathon and Orillia and will replace facilities at the end of their useful lifespan. “State-of-the art facilities that respond to the increasing demands of modern police operations are an important part of keeping communities safe,” said Michael Tibollo, Minister of Community Safety and Correctional Services. “The safety of the public will always be a key priority of our government. Equipped with improved amenities that address health and safety issues, the new detachments will remedy inefficiencies due to obsolete design and technology, as well as lack of space. “Infrastructure modernization projects, including these OPP detachments, are critical to making life better for the residents of Ontario. Infrastructure investments stimulate our economy, create jobs and help to make Ontario competitive again,” said Monte McNaughton, Minister of Infrastructure. Bird Construction Inc. (Bird) has been awarded the contract to design, build and finance the new OPP detachments. Construction is expected to begin this fall with substantial completion expected to occur late 2020. This project is part of an ongoing commitment to replace aging OPP detachments across Ontario under one major infrastructure project. Renewing multiple detachments under one major infrastructure project drives design and build efficiencies such as standardizing the design for common building components and securing bulk pricing of construction materials. The project is being delivered under Infrastructure Ontario’s Alternative Financing and Procurement (AFP) model, a modern project delivery method which transfers risks associated with design, construction and financing of the project to the private sector. Taxpayers are guaranteed a fixed price for the nine detachments.